Catharantus roseus, known as periwinkle, is highly susceptible to phytoplasma infection. Periwinkle plants showing proliferation symptoms were detected during 2013–2014 in four geographically distant states in Mexico. The presence of phytoplasmas was confirmed through the amplification of 16S F2nR2 and cpn60 UT sequences from symptomatic plants. 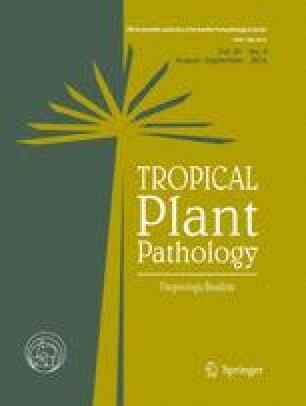 Sequencing, phylogenetic analysis and in vitro RFLP revealed that the isolates were ‘Candidatus Phytoplasma asteris’-related strains and members of the 16SrI-B subgroup, confirming the association of this phytoplasma group with periwinkle proliferation disease in Mexico. We also demonstrated that the use of the approximately 550 pb cpn60 universal target sequences allow the differentiation of two 16SrI-B strains, designated here as MePP-Centre, and MePP-South. We thank Christine Hammond and Jennifer Town for their support in lab work. This work was supported by the Genomic Research and Development Initiative for the shared priority project on quarantine and invasive species. Edel Pérez-López thanks CONACYT for a PhD scholarship (CVU: 517835).